The Times in London ran an intriguing report on Tuesday saying that the honour bestowed upon Beatle John Lennon in 1965, which he returned to the queen four years later, had “finally been rediscovered”. A quick call to Buckingham Palace suggests otherwise. 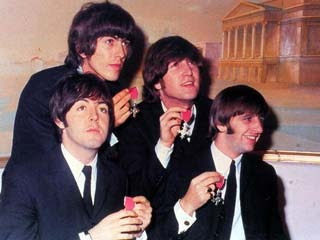 The spokeswoman did confirm that the MBE, returned by Lennon in 1969 as a peace protest, was being kept at the Central Chancery of the Orders of Knighthood at St. James’s Palace in London. But she added that, far from being “rediscovered”, she and, presumably, many others, had known for years where the MBE was being kept. Quite where the newspaper got the idea for its story is still a mystery. “It was not recently found, but it has been in the Central Chancery for some time,” the spokeswoman said. “I was asked that question (of its whereabouts) a few years ago,” she added. The spokeswoman explained that in cases where the original owner of a returned insignia dies, the Chancery would consider releasing it to the legal next of kin if such a request were made. That presumably means that Lennon’s widow Yoko Ono would have that right. The Times also reports that the medal is still in its original presentation case and sits alongside the singer’s protest letter to the Queen. If that is true, the mind boggles at how much it might be worth at auction. Beatlemania shows no sign of fading — a 97-year-old document containing clues to the identity of Eleanor Rigby, the subject of one of the Fab Four’s most famous songs, recently fetched $177,000 at auction. In July, the hand-painted drum skin that appeared on the sleeve of “Sgt. Pepper’s Lonely Hearts Club Band” sold for $1.1 million.